WITH A COUPLE OF HOURS between meetings one afternoon last summer, I walked the perimeter of BMW's Oxford plant. My hope was to take a photograph that somehow conveyed the idea of a contemporary car factory. It was not easy. A fence surrounds the facility. Anonymous modern sheds form one side. On another, dozens of resting workers sat on low walls - but without a car in sight. Only at the back the plant did the scene in my picture present itself. 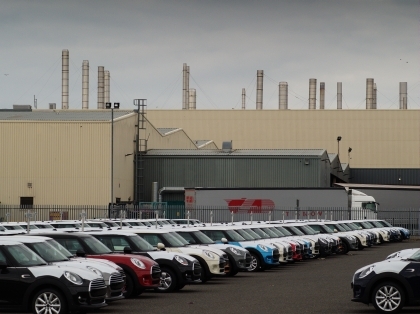 It still was not quite what I had imagined, but there were plenty of cars, as well as shiny chimneys hinting at a modern production line within. I took a few shots through a wire fence, experimenting with exposure and composition. Before I noticed it there was a security guard at my side. "You can't take pictures here, I'm afraid?" he said - courteous but insistent. Surely I was within my rights while I am on a public road, I replied? "This is not a public road, it is owned by BMW and for that reason, I am asking you to leave", came his response. I accepted his word and left. When I got home, however, I called Oxfordshire County Council to check the veracity of the guard's assertion. It confirmed my hunch: Transport Way, Cowley is a public road. The problem on which I had stumbled is one that bedevils photographers professional and amateur - attempts to prohibit taking pictures where it is actually perfectly legal. Nick McGowan-Lowe, a press photographer who sits on the NUJ's national executive confirms that my experience is widespread. "Blurring boundaries between public and private space, increasing use of security guards and paranoia about social media is making all kinds of photography more and more difficult", he says. Part of the solution is is to know our legal rights. There is a good summary in the FAQ section at epuk.org and another on this site. 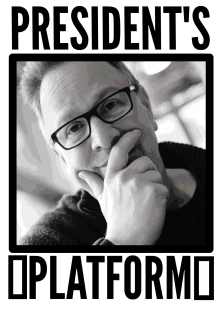 Professionals, particularly those interested in publishable, "candid" shots of celebrities, face a complex legal framework. For those with simpler aspirations it is much easier: in general, when in a public place you can use a camera without legal impediment. Even if you are asked to move on, no one has the right to summarily insist to see or delete your pictures. Courteous insistence on our rights and careful documentation where third parties try to erode our liberties are the best antidotes to over-enthusiastic security staff, in my experience. These are freedoms that could be compromised in other ways, of course. A few months ago Amateur Photographer reported that Apple is experimenting with technology to disable cameras in its own devices in discreet locations. Other reports suggest that mobile phone manufacturers are close to being able to change device settings automatically to stop phones ringing in cinemas, for example. It is easy to see how the more connected cameras become, the more their control might be excised remotely, particularly to prevent pictures being taken at concerts, of celebrities or, indeed, around the back of car factories. Perhaps film photography's renaissance will reach new heights as chemical exposure is deployed to outwit camera-disabling networks? 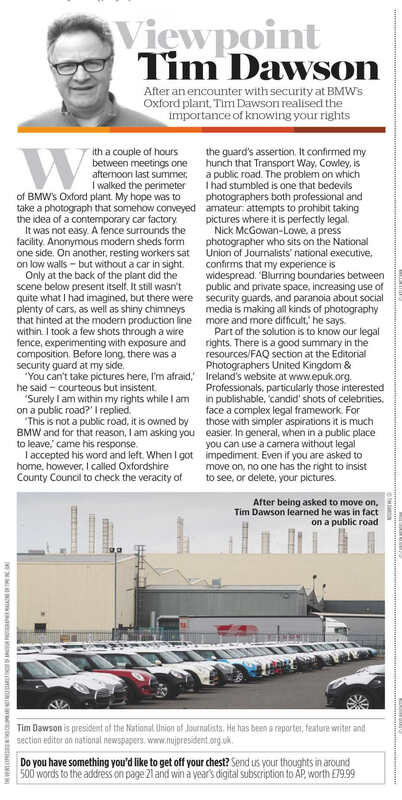 Meantime, six months after my trip to Oxford, I received a reply from BMW staff acknowledging that the road in question is indeed public and apologising for their over-zealous security. As a goodwill gesture they have offered me a free trip around the inside of their car plant - on the strict understanding that I take no photographs.